Having the right tool for the job is essential in any industry. This principle holds particularly true in mining, construction, fabrication and other industrial settings where the ability to complete a project is dependent on certain equipment. However, no matter how high-quality your equipment is, you must also have operators who understand how to use these tools efficiently. Adequate training lays the foundation that your employees will use to complete everyday and specialised work tasks. How you train your workforce can, therefore, directly impact your facility’s productivity, safety and efficacy. 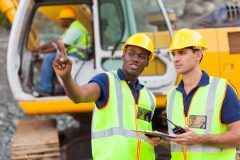 In this blog, we discuss one of the most useful forms of training: onsite instruction. Below, we list five advantages that onsite training provides you and your employees. In school, teachers give tests in order to gauge how well students understand the curriculum. In a business setting, your employees may have to use a skill immediately after learning it, often without clear indicators of whether or not they grasp the concepts completely. When an instructor provides onsite equipment training, he or she will typically also provide you with detailed performance reports for individual employees. These reports can help you identify which workers are ready to apply their skills practically and which need a refresher course. The need for adequate training in industrial settings is undeniable. Industrial workplaces often utilise some of the largest, most complex and most potentially hazardous pieces of machinery in any industry. Training ensures that employees stay safe and complete the work necessary. When you opt for onsite training as opposed to online, offsite or other forms of instruction, the expert comes to your facility. You cannot avoid the necessity of training, but an onsite course can make this training more convenient for you and your employees. Many offsite training courses are conducted in classroom settings. While this environment works to teach many principles, offsite instruction can leave your workers feeling unclear about practical aspects of their job. With onsite training, your employees receive instruction based on the equipment that they will actually be called upon to use on a daily basis. This hands-on learning method can result in more confident and more competent workers. Professionals who work in industrial industries understand that they will likely need to complete more training when they change jobs. However, the options you offer for completing this training can make positions within your company more appealing than positions with your competitors. Many operators prefer onsite training because then they do not have to take time away from their families and home lives to take a course online or at a secondary site. All industrial businesses must comply with relevant safety and operating standards. The goal of most training is to ensure that businesses can fully meet these standards during a standard work day. If your students receive remote or classroom training, the instructor may not actually see individuals performing the tasks that they learn during the course. With onsite training, instructors can see how the employees work and correct any common mistakes immediately. This increased supervision during the training process reduces the risk of fines, liability issues or accidents resulting from noncompliance with guidelines. Whether you just added a new machine to your production floor or hired a new shift of workers, consider scheduling onsite training to reap the benefits listed above. At Crozier Diamond Tools Aust Pty Ltd, we offer optional onsite training for every piece of equipment we sell. We strive to empower our clients by giving them both the tools and the instruction necessary for them to do their best work.